It’s hard to imagine the world where video wasn’t accessible to nearly everyone. Video has changed they way we connect in our day-to-day lives and has transformed the way we market. From our ability to record a quality video from our smartphones and upload it to the internet in a matter of seconds, to entire social platform being dedicated to recorded and live video streams or the fact that most people now prefer watching a video clip to reading text. Video is a game changer, and it is constantly evolving. Regarding marketing, video allows brands to connect with consumers without the clutter of written words. When marketing is focused on text we are often left to interrupt the voice and style on our own, a video provides clear direction of what the brand is trying to convey and becomes so much more relatable. We have seen the focus around video in the launch of Facebook Live, the addition of 60-second video ads on Instagram, not to mention Instagram Stories and numerous brands utilizing 360 Video and Virtual Reality to advertise. Video is the future of marketing and can be incorporated into so many different channels from mobile, search and social. Now would have been the appropriate time to plug in a video to explain what you will see but unfortunately, you are going to have to read this one! 360 Video is when a video has been shot with a circular camera and recorded entirely with panoramic views from a particular fixed point, making it so the viewers can click and drag to view the video in any direction they want while watching -not just where the camera is pointed. Both YouTube and Facebook (in collaboration with their Oculus division) rolled out their versions of 360 Video in 2015 which make it much easier for brands to utilize. When you use 360 Video on a desktop, it feels very similar to Google Maps’ Street View feature, where you click around to get different area views of the address you typed in. Using it through the YouTube and Facebook apps on your smartphone is when it starts to feel like something more. You can tap, tilt and turn your phone in any direction, immerse yourself in the content, causing your Facebook Newsfeed to come to life. With more and more people using mobile as their primary form of connecting and sharing on the internet you will see brands continue to invest in 360 Video. It’s important to remember that 360 Video is all about making the user experience as real as possible, it’s not about telling a brand’s story. At any moment, the viewer can change the perspective through their participation, which then changes the storyline and impacts the overall outcome of the video. With that kind of control, you are now allowing the viewer to become a part of the video, from having the best seat at a football game, concert or walking on the Vegas Strip – it is no longer a passive video experience. Just take a look at how Redbull has used 360 Video to bring you front and center to an F1 racing event. It’s not really about selling the Redbull brand it’s more about bringing you so close you will feel the need to invest in the real experience next time. Surprisingly, live streaming isn’t all that new. Ustream and Livestream have been around for years through desktop computers and genuinely don’t offer anything too different from Periscope. But why weren’t they able to gain the success that live streaming apps had? Periscope has taken off because of impeccable timing. The fact the smartphones have become an essential part of our lives, that they now provide front-facing cameras and people’s growing comfort with having cameras in their face (thanks to the selfie culture) has made live streaming so much more accessible. I have recently seen brands go as far as using Snapchat to reveal the questions they are planning on asking a celebrity in an interview then switching over to Periscope to broadcast their live responses. Periscope co-founder Kayvon Beykpour said he developed the app so that you are given the ability to broadcast anywhere a phone can be held, which can make content ideas limitless. However, it’s important for marketers to end every broadcast with a call to action. Give some direction to your audience whether it’s to your website or to join you in a chat on Twitter to continue the conversation. Online video advertising is currently the fastest growing category in the world. It’s a multi-billion dollar industry that every social media platform and advertiser alike wants to be a part of. One component of social video ads is their ability to autoplay. In June of 2015, Twitter announced the addition of autoplay ads (as well as GIFs and Vines) in their app. In September of 2015 Facebook, started making autoplay ads available outside of mobile apps and in early 2016 Instagram announced the ability to create 60-second autoplay ads on their platform. This is a feature marketers need to take advantage of. While many people thought the rise of autoplay ads would be the demise of Facebook it has done nothing like that for the social platform. If anything, it has made brands think outside of the box in how they should approach social video ads. Brands can no longer rely on audio for their success nor can they get away with slapping a TV commercial up on Facebook. The video ads need to be short, consumed and understood without sound and always current and new. You have to keep in mind anyone who does not want to see your ad can scroll right past so it needs to be something they can’t see anywhere else. What is it going to take to make them commit to not only watching but taking that extra step of turning on the sound? Virtual Reality (VR) barely exists in the consumer market, yet brands are already making plans around marketing through this technology. The hardware can still be expensive, and it seems like only the most significant ad budgets can utilize this avenue right now but it doesn’t mean you can’t start experimenting with how you would use VR in the future. The travel industry has been one of the early adopters of VR. It can be hard to sell someone a cruise if they have never been on one but with VR you can transport potential customers to simulated versions of destinations and travel experiences. Tony Berger, founder, and CEO of Relevant (who was hired by Marriott to help create their VR, the Teleporter) says the “secret sauce is in 4D because being on vacation affects more than just your eyes and ears”. While Marco Ryan, CDO of Thomas Cook Group says “The closer you get to the destination, the more excited you are to have that experience” or more willing you are to give up the cash to make it happen. It’s important to remember that consumers can and will demand high-quality video. VR is different from film and radio as consumers will be a lot less forgiving of bad VR ads than they are of TV commercials. You are selling something like a “reality,” people are going to expect it to be as real as possible not to mention that a bad experience could leave someone feeling motion sickness for the rest of the day. There is immense value in building engaging content through VR. “Imagine sharing not just moments with your friends online but entire experiences and adventures—just by putting on goggles in your home,” said Mark Zuckerberg, CEO of Facebook in a post discussing the acquisition of Oculus in 2014. 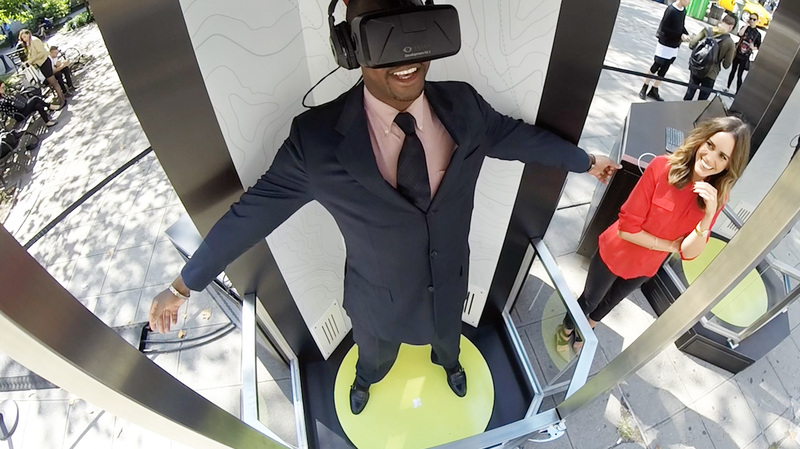 By building engaging content through VR, brands aren’t just selling a story they are providing experiences that are impacting consumers like never before. While there are more cost-effective ways to produce visual content 51.9% of marketing professionals worldwide name video as the type of content with the best ROI. Video gives brands the opportunity to communicate with consumers, share experiences, tell stories and plays a vital role in branding. Thanks to bandwidth improvements, access to smartphones and new technology- video is changing how we connect with our consumers. Have you started to incorporate live streaming into your marketing strategy? Check out more content about video, like this post How To Get Rolling With Live Video, here.